We are Batter The Haddock, available for weddings, bar mitzvahs and funerals. and you will be hearing from our solicitors. We're going to play our theme song now, and we'd like you to sing along. The Batter the Haddock story began in Cambridge, where the band met while studying subjects ranging from music to Anglo-Saxon (via engineering). Their steadily growing reputation culminated in two extremely successful performances at the prestigious Newnham May Ball and St Catherine's May Ball (bringing the event to a heady climax with a whirl of dancing!) and a late evening slot on the Acoustic Stage at the Strawberry Fair festival - with one observer describing them as "the epitome of Cambridge ceilidh cool". The Haddocks - as they are affectionately known - went on to bring their rude raucous sound to many parts of Britain, combining fine instrumental virtuosity, a lively iconoclastic attitude, and a certain enthusiasm for the demon booze (allegedly). Their repertoire included traditional tunes and call dances from Ireland, Scotland, Wales and England, throwing in the odd bit of the Spice Girls, Gina G, or Kurdish folk music for good measure: and they are guaranteed to get any crowd on their feet with the traditional first dance, "Drinks For The Band". Batter the Haddock have also been known to play jazz, and even string trios. Really. Here we are playing jazz at the George Hotel in Stamford (which is very nice). The Haddocks can now only be tempted out of retirement by a very large cheque, or alternatively some free drinks. The Haddocks played over fifty gigs: the list below contains a few that we can remember. 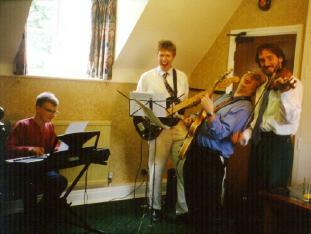 April 2005 Special Haddock Reunion Gig! Batter the haddock, batter the haddock, batter the haddock. Haddock battery, haddock battery, it's the one for me! Going to the middle of Northamptonshire with the nasty Hashers, listening to all their filthy songs, joining in the spirit of the occasion by embarking on a lusty round of The Ballad of The St Wadegund and being greeted by a frosty silence. "Do you mind if I play your guitar?" (At Newnham May Ball.) Yes, we do. F--k off. James's dad, making a guest appearance on banjo, going up to the mic during a Clare gig and clearly enunciating the word "clusterf--k" (this one may be apocryphal). "You're a disgrace to your parents and your schools" (Yorkshire, 1996). Being abused for playing "English shite" by an unpleasant old Irishwoman at the gig in K-ntish Town (having just played two Scottish, two Welsh and an American tune). Three hundred people in Fisher House all shouting "Arse!" in chorus. Including some priests. BTH vs Oxford Catholic Chaplaincy ceilidh band (away fixture). Being paid to go away by the Blue Boar on Trinity Street, Cambridge. Dan plays in Eklectica. Nice. The Round Band play lots of nasty modern tunes with far too many cadences per bar. Unlike Batter the Haddock, they are not the epitome of Cambridge ceilidh cool, and their line-up is very silly. But they're a fine bunch of lads and lasses. The Gnome, aka Jonathan Coxhead, is a nice helpful calling bloke who provided the Haddocks with some of the politer parts of their repertoire, as well as making up a completely spurious tradition called 'Molly dancing' (I ask you). All the luvverly links that take you here.